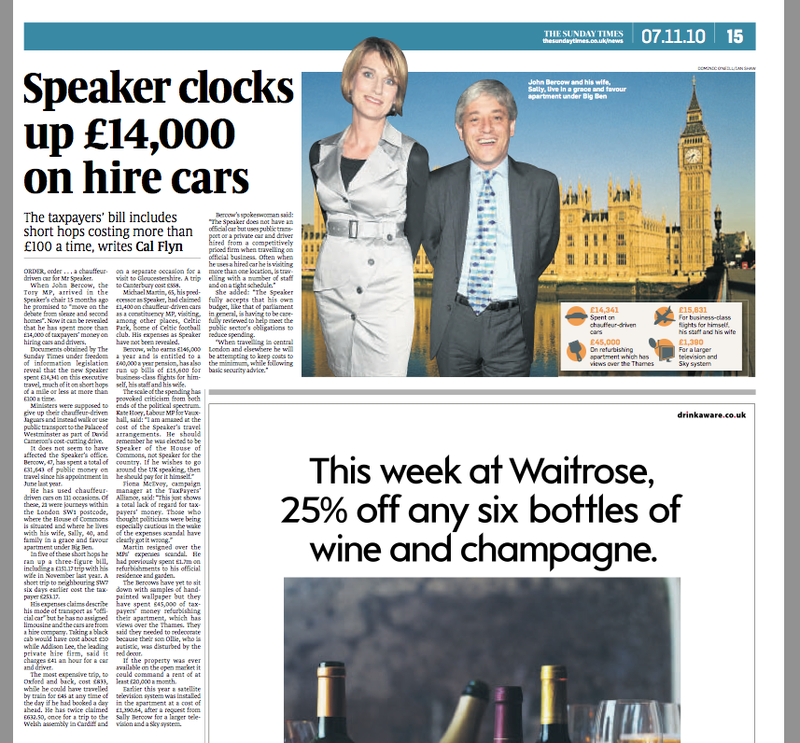 Order, order … a chauffeur-driven car for Mr Speaker. When John Bercow, the Tory MP, arrived in the Speaker’s chair 15 months ago he promised to “move on the debate from sleaze and second homes”. Now it can be revealed that he has spent more than £14,000 of taxpayers’ money on hiring cars and drivers. Documents obtained by The Sunday Times under freedom of information legislation reveal that the new Speaker spent £14,341 on this executive travel, much of it on short hops of a mile or less at more than £100 a time. Ministers were supposed to give up their chauffeur-driven Jaguars and instead walk or use public transport to the Palace of Westminster as part of David Cameron’s cost-cutting drive. It does not seem to have affected the Speaker’s office. Bercow, 47, has spent a total of £31,643 of public money on travel since his appointment in June last year. He has used chauffeur-driven cars on 111 occasions. Of these, 21 were journeys within the London SW1 postcode, where the House of Commons is situated and where he lives with his wife, Sally, 40, and family in a grace and favour apartment under Big Ben. In five of these short hops he ran up a three-figure bill, including a £151.17 trip with his wife in November last year. A short trip to neighbouring SW7 six days earlier cost the taxpayer £253.17. His expenses claims describe his mode of transport as “official car” but he has no assigned limousine and the cars are from a hire company. Taking a black cab would have cost about £10 while Addison Lee, the leading private hire firm, said it charges £41 an hour for a car and driver. The most expensive trip, to Oxford and back, cost £833, while he could have travelled by train for £45 at any time of the day if he had booked a day ahead. He has twice claimed £632.50, once for a trip to the Welsh assembly in Cardiff and on a separate occasion for a visit to Gloucestershire. Michael Martin, 65, his predecessor as Speaker, had claimed £1,400 on chauffeur-driven cars as a constituency MP, visiting, among other places, Celtic Park, home of Celtic football club. His expenses as Speaker have not been revealed. Bercow, who earns £146,000 a year and is entitled to a £40,000 a year pension, has also run up bills of £15,600 for business-class flights for himself, his staff and his wife. Martin resigned over the MPs’ expenses scandal. He had previously spent £1.7m on refurbishments to his official residence and garden. The Bercows have yet to sit down with samples of hand-painted wallpaper but they have spent £45,000 of taxpayers’ money refurbishing their apartment, which has views over the Thames. They said they needed to redecorate because their son Ollie, who is autistic, was disturbed by the red decor. If the property was ever available on the open market it could command a rent of at least £20,000 a month. Earlier this year a satellite television system was installed in the apartment at a cost of £1,390.64, after a request from Sally Bercow for a larger television and a Sky system. She added: “The Speaker fully accepts that his own budget, like that of parliament in general, is having to be carefully reviewed to help meet the public sector’s obligations to reduce spending.